Our ‘Pink Parasol'™ Proven Winners® Combination is a simple, yet dramatic combo. Containing Midnight Illusion Ipomea, a.k.a. Midnight Illusion Sweet Potato Vine, and Supertunia® Vista Bubblegum, a self-cleaning, vigorous hybrid petunia, the contrast and architectural interest are utterly stunning! 1 or 2 combos to fill a container up to 10-inches in diameter. 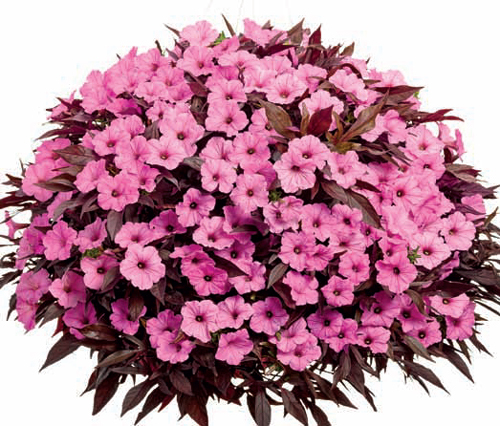 2 or 3 combos to fill a container that is 12 to 14-inches in diameter. 3 or 4 combos to fill a container larger than 16-inches in diameter. The plants in our 'Pink Parasol' Flowering Combinations are grown and shipped in fine quality growing medium and are guaranteed to arrive alive and ready to thrive.